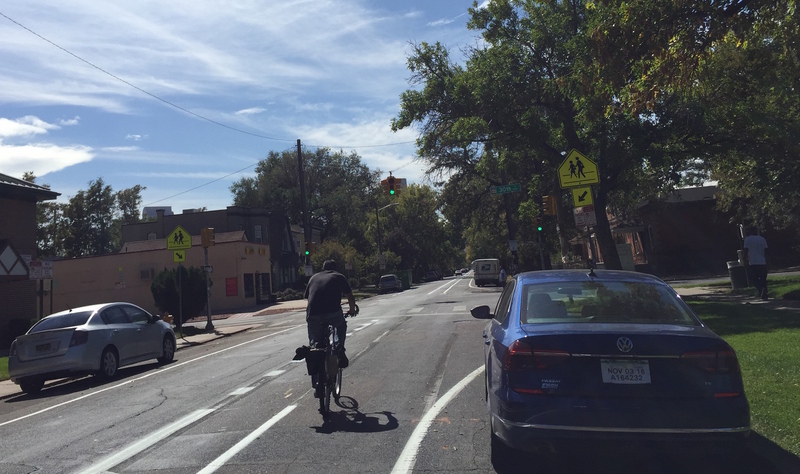 Denver Public Works has given people more room to ride bikes on Champa Street. Crews have finished striping the one-way street to better delineate the existing bike lane from the auto traffic lane between Downing and 19th. There, the route connects to the existing buffered bike lane — which still has some gaps — that continues southwest through downtown to Speer Boulevard. All in all the buffered bike lane on Champa is about two miles long. Champa’s new treatment is a step up from the standard. But a block away, on Stout Street, DPW will implement a much better one. Crews are preparing to install Denver’s fourth parking-protected bike lane along Stout, which is one-way outbound. Between the two street redesigns, DPW is giving riders better options for traveling into and out of downtown. If you want to know more, check out the details and diagrams from Streetsblog’s earlier coverage. This has been a nice change, particularly the right-turn only lane at MLK and Downing. Drivers are lining up in the left lane blocks in advance creating a de facto bike lane that was full of drivers honking and buzzing cyclists. It’d be great if DPW could connect the bike lanes on Champa/Stout to 31st/MLK to create a safe east-west route. There’s so much pavement, especially on 31st, that it’s insane such low-hanging fruit hasn’t already been done.